+ Lion is the accessibility startup founded by slightly autistic web designer / developer Jamie Knight and his plushie sidekick Lion. We focus on practical accessibility and offer a range of services, principally accessibility support, accessibility testing / reporting and presenting. We also Design & Develop for the web. 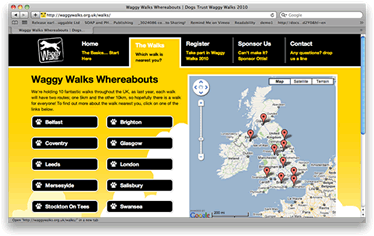 Over the last two years we have worked with Dogs Trust on the Waggy Walks promotional website.